An Ayurvedic term for ‘air and space’, Vata is a meditation on both the far-reaching possibilities and the intimacy of drawing. 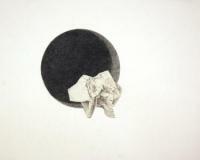 Presented by City Center Gallery, Vata is an exhibition of graphite and charcoal drawings by local artist Jill Raymundo. Multiple drawings series comprise the exhibition, ranging from intricate, textural collage drawings of commonplace objects to large-scale cloudscapes based on images taken from an airplane window. Born in Manila to architect parents, Jill Raymundo was drawn to visual art at an early age. Due to the country’s political unrest, her family immigrated to the United States when she was a year old, and she grew up in Toronto, Ontario; Columbus, Ohio and Vancouver, British Columbia. She attended the Columbus College of Art and Design on a full scholarship and graduated in 2004 with honors, in addition to studying at the AICAD New York Studio Program in Parsons School of Design. Raymundo has divided her time in recent years between Manila, Vancouver and Portland, Ore. teaching art, contributing to the education department at the University of British Columbia’s Museum of Antrhopology, and co-creating a small eco-friendly design studio. She has had solo and group shows at the Riffe Center in Columbus, the Smithsonian in Washington DC, and several galleries in New York City, the West Coast and Manila. She returned to Columbus in 2012 to pursue her art and design work. Sacred Vessels are based on an array of timeless utilitarian and lidded vessel forms. Throughout history these containers have been devoted exclusively to one purpose or use. The show features fusional abstractions of pagodas, western utilitarian ceramics, and Christian temple motifs. We hope these vessels will speak to you. Q: When and how did you come to be an artist? A: A few years ago, a friend of mine, who was also a co-worker, showed me her portfolio of new work and invited me to her gallery opening. Something about her work inspired a great curiosity in me. She sat me down and had me draw an apple that was sitting on the table. What I came up with was a sad, flat-looking thing that looked more like an orange. So she told me to stop trying to draw an apple and see around the apple. In other words, she was telling me to pay attention to shapes, lines, and shadows instead of trying to recreate a particular object. It took a few tries, but at one point I looked up from what I was drawing and couldn’t believe it. I had drawn a very round-looking figure with some real depth. It even looked like an apple. Before I left, she gave me an easel, a few tubes of paint and some starter brushes. Q: Could you explain your motto further? A: Part of this comes from being self-taught. I started painting before I really knew anything about the technical aspects. Once I took my first workshop and started talking to people about their technique(s), I realized that while it’s fantastic to have extensive training, artists can also get caught up in the technical elements so much that it stifles creativity. I like to learn how things work, but then I also love to break the rules and see what comes from it. Often what would technically be considered a “failed” substrate or film is incredibly interesting and something I could never have done on purpose. In art, you just never know where an accident will take you. So, “No rules, just paint” is also a way of expressing that there’s no telling what I’ll come up with next. Q: What education have you sought out to hone your skills? A: I’ve attended a workshop here and there on watercolors and one on drawing, but by far I’ve learned the most from reading and by watching other artists and asking questions. I have a number of amazing and generous artist friends, including the one who got me started. I love watching people work, particularly if I can see them live. I read art instruction books as well as books on individual artists and time periods. I go to museums and sketch and find artists whose work intrigues me. Q: Where do you find your greatest inspiration for your work? A: I’m most inspired by the weather. I don’t know why except that when I moved to the Midwest, I started noticing how different the colors are here compared to California. The fall colors were so different that initially all I wanted to paint were trees. My culture inspires me as well—being from San Francisco, Latina, and an honorary Midwesterner. Sometimes I’ll see something–a scene, a photograph or an image–and I’ll know that I want that to become a painting. Lately, I’ve been working on sketching comics. I’ve been reading graphic novels as part of my graduate work. My sketches are inspired by random stories I hear. I’ve started to think about how to retell these stories in just a few panels. Q: How do your techniques and style relate to your vision or philosophy? A: This is a tough question for me, as I don’t think of myself as having a particular style. Though if you see me work, what stand out are my use of texture and perhaps my use of color. I’m very much into texture. Most of my textured acrylic pieces are durable enough to be touched. When I’m creating those, I’m constantly touching them and moving things around or layering to build the topography and literally get a “feel” for the piece. I’m very tactile. I also tend toward bright, evocative colors. I use quite a bit of hansa yellow and ultramarine blue and work with heavy pigment loads. For the most part I don’t do a tremendous amount of blending so that the colors stay as bright as possible.